Once in a while, I get to do some very cool things. I’m very fortunate in that way. 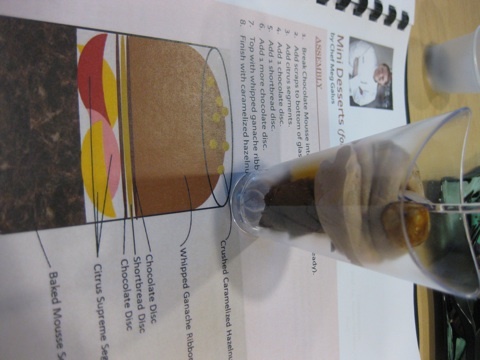 Last week an email came over the wire from Gale Gand with an invitation to join her at the Barry Callebaut Chocolate Academy for a demonstration. 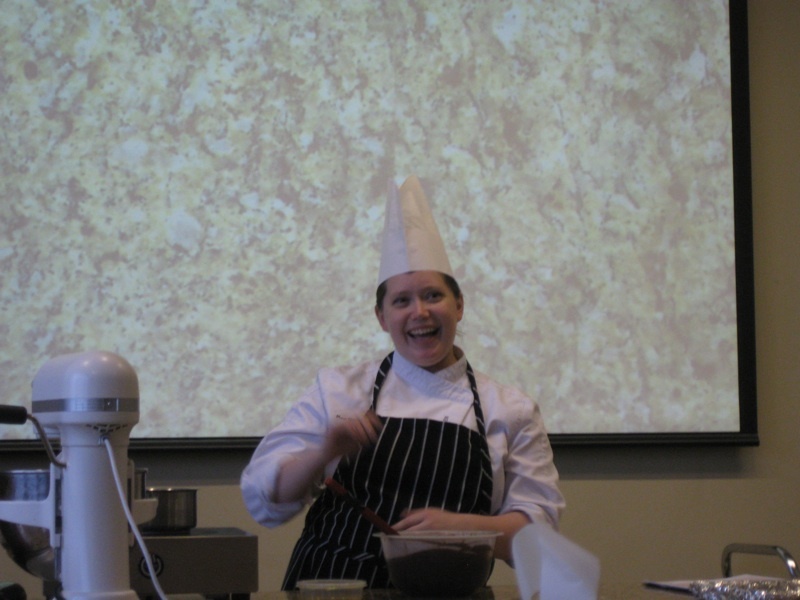 That our friend Pastry Chef Meg Galus was giving the demo was an added bonus. You don’t have to ask me twice. Meg (that’s her above in the snappy hat) and I both worked for Gale at TRU, a fine dining restaurant in Chicago and later I would pitch in here and there to help Meg out when she was down a person. I was a sort of freelance pastry chef for a while and it worked well for both of us. She’s now the Pastry Chef at NoMi Kitchen in the Chicago Park Hyatt and makes some amazingly delicious things. I mean really delicious things. If you haven’t been there yet, go now. All the food is amazing. Plus, she’s a good person and a great friend so I would have shown up to support her and be a friendly face in the crowd regardless. And to mock her endlessly. I’m a good friend like that. Barry Callebaut is one of the predominant suppliers of quality chocolate in the world. Several years ago (3? 4?) they moved their North American headquarters from Canada to Chicago and built a beautiful showplace space. The office is mainly sales and marketing personnel but there’s also a brand, spanking new state-of-the art kitchen where they have opened a Chocolate Academy. 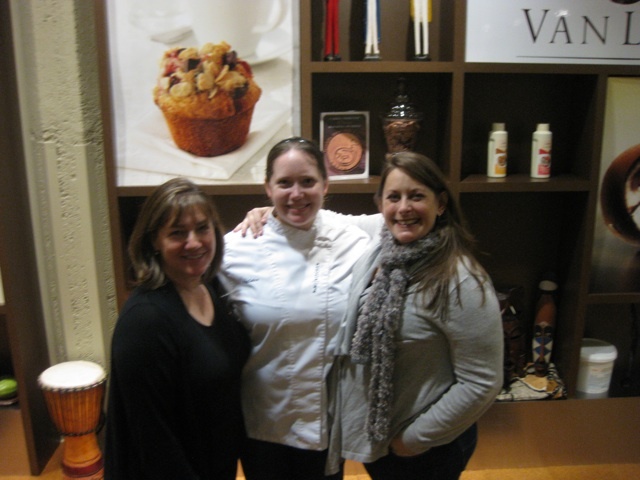 All kinds of classes are offered, from beginner to professional levels, from leading chocolate experts and technicians. If you need to brush up on your chocolate showpiece skills, this is the place. It’s been a while and my chocolate skills have atrophied a bit … looking around at the student’s handiwork, I’m thinking I may need a refresher. For the demo, we were ushered into an auditorium, handed swag bags filled with various product pamphlets and samples (always good.) 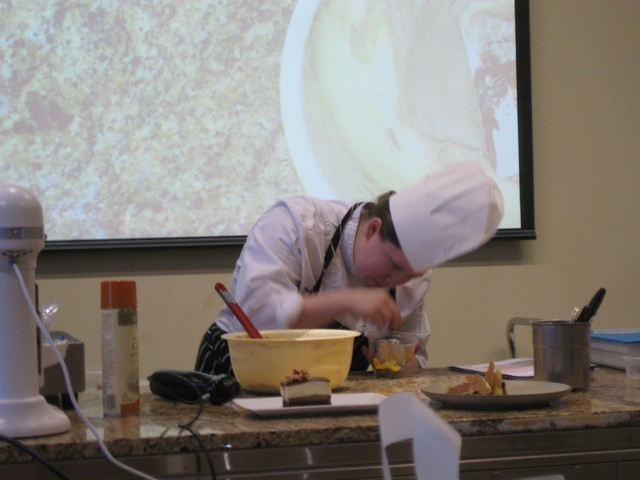 Meg then proceeded to show us how to take a few core components and make several different desserts in her typical efficient skill and humor. She discussed the challenges of working in a hotel versus a typical restaurant and the very different needs and requirements of each. First off, there’s the restaurant – NoMi Kitchen – with all its press and accolades but there’s also 24-hour room service, hotel amenities (where’d you think that chocolate on your pillow came from? ), banquets, Sunday brunch buffets, private parties and weddings in addition to the occasional dinners catered for the VIP condo residents that live on the higher floors. Oh and because it’s a hotel, it never closes. Christmas, New Year’s Day, Superbowl, random Mondays? All open for business. It’s a kitchen that technically never closes and it takes supreme organization skills to keep it all straight. It doesn’t hurt if you have a touch of perfectionism. That would be Meg and that’s why we love her. Above all, Meg is a realist. She knows exactly how much her staff of four can handle so she makes many core pastry components cross-functional. For example, there’s a baked chocolate mousse cake that is delicious on its own but can also work as the base of a banquet mousse cake, crumbled on the plate of a fancy restaurant dessert or as a layer in a brunch parfait. 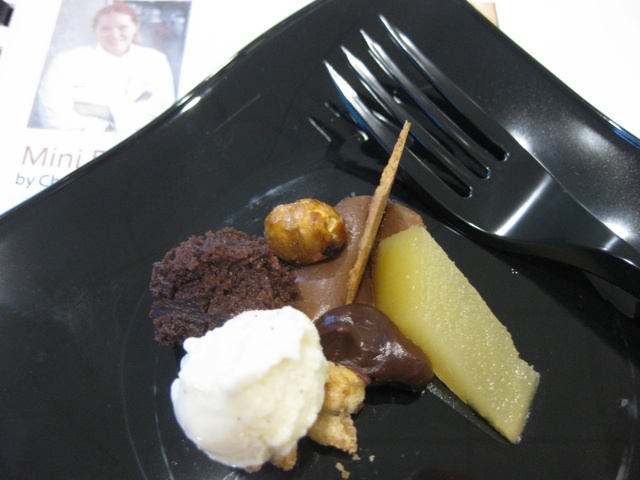 Vary the accompanying components and you can make that one thing into several different desserts. I’ve made that mousse cake hundreds of times yet hadn’t fully considered it’s versatility. Even in our busy home kitchens, it’s good to have workhorse recipes like this that cover a multitude of uses. Of course we got to taste everything. 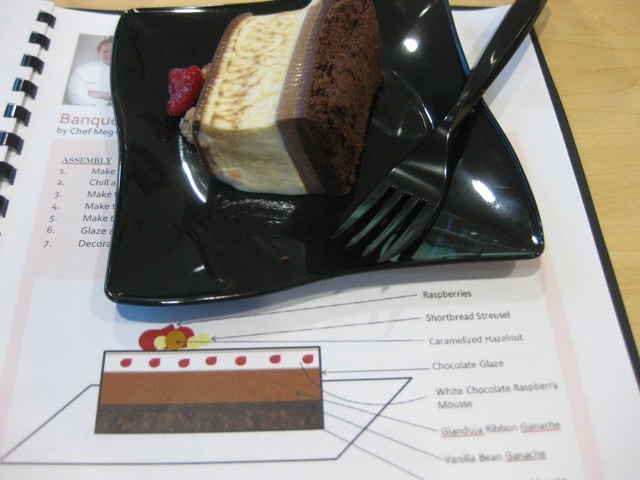 That’s the best part and samples were plentiful of both the desserts and various chocolates that we discussed. I don’t know where I can find Callebaut’s “Cara Crakine” but I intend to find out. Or figure out how to make my own. That stuff was stinkin’ delicious. I am afraid to consider the consequences of getting my hands on a bucket. If you’re in Chicago and looking to increase your chocolate knowledge and skills, I recommend stopping by. Non-professional classes are four hours long and $100 which is a great price for the quality of information you’ll receive. Professional level class cover a variety of subjects, are 2-4 days long depending on the topic and appear to top out at $850, which is really reasonable. If you’re in Canada, Europe or Southeast Asia, there are academies there as well – check out the website.